In this article, we will look into what happens when one of the message processor throws an exception. How mule handles exception? Our first strategy would be the default exception strategy. In our first example, there won’t be any explicit exception handler. Let’s define a transformer that throws exception of the payload is ‘INVALID_INPUT’. We also define another custom processor right after the transformation. In order to trigger the flow that leads to an exception, we post message ‘INVALID_INPUT’. As you can see from the output below, there is a always an implicit default exception strategy provided by Mule which simply logs the exception. If a transaction is involved, it will rollback. Since the transformer throws an exception, the message is not passed further to the processor. Message               : Invalid input! (java.lang.RuntimeException). 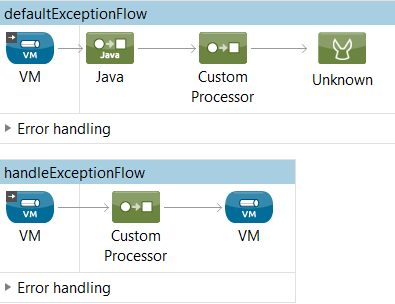 In the next example, we will configure a default exception exception strategy within the flow using <default-exception-strategy>. If any exception in the flow, the message is delivered to an outbound endpoint called “handleException”. Any exception message posted to endpoint ‘vm:\\handleException’ will be passed on to the below handler. We will first pass an INVALID_INPUT and then pass a normal payload so that we can see how mule handles the exception one differently. In case of any exception, the payload is passed on to the exception handler. The payload is now of type ExceptionMessage. One can retrieve the exception and the original payload from it. The The successful payload passes thru the transformer as well as the processor. Exception: org.mule.api.transformer.TransformerMessagingException: Invalid input! (java.lang.RuntimeException). This was an example about Mule’s default exception strategy.